Our beloved Imam Sir Sultan Mohammad Shah (A. S.) graciously blessed the Jamat with his Didar at Limbdi (Vadhvan) in Gujarat in 1938. During this visit, the Imam had a meeting with president of all the councils and jamati leaders across India in the Royal Palace of the king of Princely State of Vadhvan. Late Itmadi Ladjibhai Jivan Patel of Meloj and Itmadi Vajirbhai Aliji Maknojia of Meta represented Sidhpur at this meeting. The Imam enquired about the Jamat across India to the leaders present there.Leaders from Sidhpur humbly submitted to the Imam that the Jamat in Sidhpur and surrounding areas was financially very weak and lacked in education. Imam benevolently provided guidance to the leaders from Sidhpur to establish a co-op bank to provide financial support to the Jamat and a boarding to facilitate better education to the children. Imam graciously granted a amount of Rs. 30,000 from His Highness the Aga Khan Golden Jubilee Gold Grant Committee as a grant towards this cause. Our leaders respectfully accepted the Farman and gave commitment to act as guided by the Imam. To fulfill the commitment given to Imam, a committee under the leadership of Itmadi Ladjibhai Jivan Patel and Itmadi Vajirbhai Aliji Maknojia was formed. With the monetary support , guidance and blessings of Imam and cooperation and support from Sidhpur Jamat, a Co-operative Bank viz. The Uttar Gujarat Ismailia Momin Bank (Later converted to a primary Co-op. credit society – now known as The Agricultural Development Co-op Credit Society Ltd.) and a hostel – Aga Khan Hostel, Sidhpur came into existence on 14th October 1938 and 4th September 1938 respectively. Itmadi Ladjibhai Jivan Patel was the founder President of both these prestigious institutions. Since 1938 both the institutions have beenserving our community efficiently. Aga Khan Hostel Sidhpur was started in 1938 with only 10 students in rented premises. The monthly hostel fee then was only Rs. 4 to Rs. 5 per student. Students were attending vernacular schools in the neighborhood. Later, the hostel was shifted to the bungalow owned by Itmadi Ladjibhai Jivan Patel near Saifee High School in Sidhpur where three separate rooms were allocated as hostel for the students. In 1947, with generous support from Jamat the hostel management committee acquired a farmland known as “Panjetani Baug” admeasuring about 2 biga with a farm bungalow, 4 rooms, a well, a swimming pool and garden for Rs. 17000.00 and again in 1954 the adjacent farmland known as “Akberi Baug” admeasuring about 11.50 bigha with 2 farm Bungalows, 6 rooms , 3 swimming pools and garden was acquired for Rs. 15500.00 in Sidhpur . In1947 students shifted from Itmadi Ladjibhai Patel’s bungalow to Panjetani Baug – our own premises. On 16th March 1952, Prince Aly Salman Khan arrived Deesa by a plane and visited Sidhpur by road via Methan. A pendol was erected in the hostel premises for the visit . Prince Aly Salman Khan Sahib guided our leaders to enhance student intake capacity for 100students in the hostel. On 3rd January , 1958 a trust – H. H. The Aga Khan Golden Jubilee Ismailia Sidhpur Boarding & Orphanage Sidhpur – was formally registered with the Charity Commissioner , Mehsana. By efforts of our leaders, access to education increased in Sidhpur Jamat in the course of time. In response to the increased educational needs, hostel management committee decided to have a modern hostel building in Sidhpur. Fortunately, Maulana Hazar Imam Shah Karim visited visited Sidhpur Jamat for the first time on 15th September 1962. A gorgeous Padhramani Pendol was erected in the hostel premises. Upon request of Hostel management committee, the foundation stone of the hostel building was laid by our eloved Hazar Imam on this occasion. 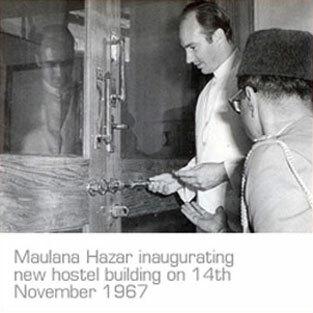 During the ceremony Hazar Imam guided the leaders to construct the hostel building in such a manner that it looks a modern building even after 20years from the construction and Imam quoted Mahmadi Academy of Karachi as an example. With zeal and enthusiasm the hostel management committee collected funds from the Jamat more particularly from the Sidhpur Jamat residing in Mumbai. With generous support from the Jamat new Hostel building constructed and the inauguration of the said building performed on the 14th November 1967 by Maulana Hazar Imam during the Sidhpur visit. In the course of time education in Jamat increased so the demand of the hostel facilities. To meet the increased demand of the hostel, first floor added to the hostel building in 1973. As the time passed by, transportation facility from villages to Sidhpur increased as well as our boys preferred to proceed to big centers for quality education, the number of students gradually decreased year by year in the hostel. Boys in the Jamat were getting fairly good education but the girl education was negligible in the Jamat. This was a serious concern for the community. To obviate educational inequality between boys and girls need for women education was felt in the Jamat. To encourage women education in the community, hostel management converted the boys hostel to girls hostel in the year 1988 during the Golden jubilee of the hostel.Commencement of girls hostel in Sidhpur tremendously boosted women’s education in the Jamat. The availability of equal and enough educational opportunities to boys and girls significantly enhanced overall level of education in the Jamat. This development led to a strong need of our own quality school in Sidhpur. Alike in the past, once again with overwhelming support of the Jamat, Aga Khan School – Sidhpur was established in 1993 for quality education for our children. The hostel parted with a chunk of land and built a school on it and donated the land along with the building to the Aga Khan Foundation. The school is currently run and managed by Aga Khan Education Services India, Mumbai. With the changing time to provide maximum feasible facilities to enable students feel comfortable, the management made huge changes in amenities with addition of some new facilities in the hostel in the year 2000. A new computer room with latest computer system came into existence. A new library with comfortable chairs tables & chairs and books for curricular reading was established. Comfortable beds with beddings, individual locker, special space with table and chairs and wardrobe provided in each dormitory. Toilet facility augmented by increasing the in numbers of bathrooms. A major renovation of hostel building took place in 2003 which included water proofing of terrace, re-plastering of the building, beautification of main gate of the building by granite stone. A garden with green lawn and decorative plants developed surrounding the hostel building. Majority of our children were attending English medium schools in Sidhpur. As there were no English medium college available in nearby towns our community felt need of hostel facility for children in big city for better education in good English medium colleges. To facilitate our children for better higher education, the management with the support of Aga Khan Council for Sidhpur and community leaders started a boys’ hostel in 2003 and a girls’ hostel in 2004 in Pune. The commencement of hostel in Pune encouraged our youths to prefer Pune and Bangalore for higher education. It is our pride that 22 students from Pune hostel have gone abroad for higher education and career. As a part of celebration of the Golden Jubilee of Imamat, our beloved Hazar Imam visited Sidhpur for a historical Golden Jubilee Darbar on 16th May 2008 for entire Gujarat Jamat. 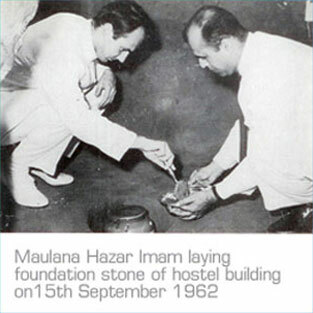 The Golden Jubilee of Imamt and the Platinum Jubilee of the Hostel coincidently fall in the same year. To commemorate the event the hostel management established a “Sidhpur Cultural Museum” in Sidhpur in the collaboration with Sidhpur Development Foundation, Mumbai. The museum exhibits and displays our art, culture and traditions. 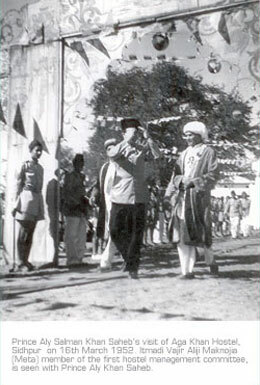 16th March, 1952: Prince Aly Salman Khan’s Sidhpur visit. 15th September, 1962: Maulana Hazar Imam’s Sidhpur visit. 14th November, 1967: Maulana Hazar Imam’s Sidhpur visit. 23rd November, 1973: Maulana Hazar Imam’s Sidhpur visit. 21st January, 1978: Maulana Hazar Imam’s Sidhpur visit along with Her Highness Begum Salima. 9th February, 1989: Maulana Hazar Imam’s Sidhpur visit. Her Highness Begum Salima visited the hostel on 21st January 1978 during her Sidhpur visit with Maulana Hazar Imam. Her Highness Begum Salima had a meeting with members of hostel management committee and students in the hostel. This institute has contributed a lot to the educational development of Ismaili Jamat. Since 1938 many boys and girls from our community have availed of benefit of hostel facilities as a student. Many of them have gone abroad to pursue their further studies and career. The institute has produced many businessmen, managers, engineers, doctors, nurses, magistrate, pharmacists and teachers etc in our community. The hostel has changed with the changing times and tothe need of the jamat. Currently about 100girls from across India are pursuing their studies in the premises surrounded by fine landscaping with lush green garden in the heart of sidhpur with modern facilities including spacious dormitory , library, dining hall, conference room ,computer room and study room. The management and the trustees look forward, with generous support and cooperation from the community, to many more decades of services to the jamat by providing enabling environment conductive to quality education to our children and equipping them to meet the challenges of the future.